Are the United States, the North Atlantic Treaty Organization and Russia on a mad spiral leading to yet another war in Europe? Is it inevitable? Far from it. 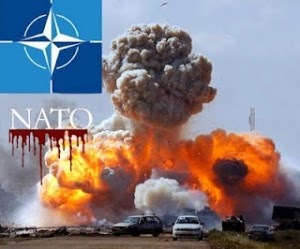 The US-propelled vassal currently starring in the oligarch dance in Ukraine, Petro Poroshenko, last week advanced the proposition that Ukrainians in the near future, after his “reforms”, will be asked to vote on whether to join NATO. Let’s be serious here. Many of you will be familiar with the concept of “shatter belt” – territories and peoples that historically have been squeezed between the Germanic Eagle and the Russian Bear. As we stand, the whole shatter belt – apart from Ukraine and Belarus – has signed up to NATO. A new Berlin wall, this time US-built – from the Baltics to the Black Sea now runs through Kiev. Were Ukraine to become a NATO member in an albeit remote future, the shatter belt buffer zone would disappear. This means NATO – essentially the US – planted right on Russia’s western border. Washington has just announced that it will be pre-positioning more military vehicles in Europe to be used in exercises or “potential military operations”. This is perfectly in tune with the relentless US Think Tankland spin that NATO and the US will be “forced” to balance their commitment to security in Eastern Europe against potential Russian “aggression”. As Ukraine, the Baltic states and Poland persist in compounded hysteria about such “aggression”, the option of a post-MAD (Mutually Assured Destruction) US-Russia nuclear war, terrifying as it must be, is now – casually – back on the discussion table. At least there’s a countercurrent: strands of informed Americans are wondering why the US should be paying for Europe’s defense when European GDP is larger than that of the US. Now for the “threat” of nuclear war in Europe – bogus or otherwise. It’s pointless to compare the strategic nuclear capabilities of the US and Russia based on numbers, but not on quality. Take the compounded GDP of US, Germany, France and the UK and compare it to Russia; it’s a victory by landslide. Then examine the strategic nuclear scenario, and it’s a totally different story. GDP alone does not “win” anything. Washington/Wall Street elites are now deep into nuclear war paranoia. A Council on Foreign Relations study basically “found out” what Pravda had already reported. Other pieces such as this at least hint at the obvious – glaring US strategic shortcomings. Russian ICBMs armed with MIRVs travel at about 18 Mach; that is way faster than anything in the US arsenal. And basically they are unbeatable. The S-400 and S-500 double trouble. Moscow has agreed to sell the S-400 surface-to-air missile system to China. The bottom line is this will make Beijing impermeable to US air power, ICBMs and cruise missiles. Russia, for its part, is already focusing on the state-of-the-art S-500 – which essentially makes the Patriot anti-missile system look like a V-2 from World War II. The Russian Iskander missile travels at Mach 7 – with a range of 400 kilometers, carrying a 700 kilogram warhead of several varieties, and with a circular error probability of around five meters. Translation: an ultimate lethal weapon against airfields or logistic infrastructure. The Iskander can reach targets deep inside Europe. And then there’s the Sukhoi T-50 PAK FA. Talk about a real near-future game-changer. NATO clowns dreaming of a war on Russia would have to come up with an ironclad system to knock out the Iskanders. They don’t have any. Additionally, they would have to face the S-400s, which the Russians can deploy all over the spectrum. Think of a hefty batch of S-400s positioned at the enclave of Kaliningrad; that would turn NATO air operations deep inside Europe into an absolutely horrendous nightmare. On top of it, good ol’ NATO fighter jets cost a fortune. Imagine the effect of hundreds of destroyed fighter jets on a European Union already financially devastated and austerity-plagued to death. Just in case the “pivoting to Asia” gang starts harboring funny ideas about the Middle Kingdom as well, China is massively investing in bouncing lasers off satellites; satellite-hitting missiles; silent submarines that surface beside US aircraft carriers without prior detection; and a made-in-China anti-missile missile that can hit a reentering satellite moving faster than any ICBM. In a nutshell, Beijing knows the US surface fleet is obsolete – and undefendable. And needless to add, all of these Chinese modernizing developments are proceeding way faster than anything in the US. The spin by the Washington establishment has been relentless: Russia is expanding towards a 21st century empire. And yet there is a solution to defuse the current, hysterical rush to war logic. HereI have examined in some detail how Washington is playing Russian Roulette. Now it’s time to advance a modest proposal – as it has been floated by a few concerned analysts from the US, Germany and Asia. Stalin, at the outset of World War II, took East Prussia from Germany and moved the eastern part of Poland into Ukraine. Eastern Ukraine was originally from Russia; it is part of Russia and was given by Lenin to Ukraine. Everyone get their share. No more Stalin. No more arbitrary borders. That’s what the Chinese would define as a “triple win” situation. Of course, the Empire of Chaos would fight it to death; there would be no more chaos manipulated to justify a crusade against bogus Russian “aggression”. Pepe Escobar‘s new book, just out, is Empire of Chaos. Follow him on Facebook.